Summer Theater Camp is a fun, educational, and affordable two-week program that gives kids the opportunity to learn about acting and develop their creative, reading, and social skills. Geared towards children ages 6 (who have completed kindergarten) through 12, camp runs daily from 9:00 AM - 4:00 PM. Campers pack a lunch and Batavia Players supplies snacks in the morning and afternoon. Campers will learn and demonstrate the knowledge of stage directions, play theater games, develop vocal technique while learning songs from the show, be instructed in dance appropriate for the show and work together as a team. Campers will also be completing craft projects over the two weeks. Camp culminates with two evening performances, giving campers the opportunity to put on a professional show before a live audience. Our show this year is Seussical Kids. 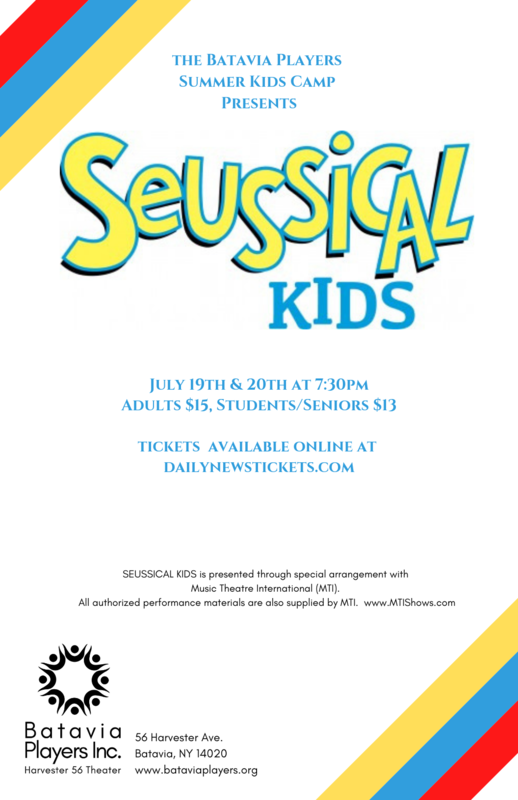 Seussical Kids looks at the world of Doctor Seuss through the use of song, dance and laughter. Horton hears a lot of Who's in this production and there is sure to be a lot of joy, fun, and thrilling adventures for our young actors, dancers and singers. Tuition for the two-week program is $185 per camper, and $165 for each additional child from the same family. I have been participating in the Batavia Players Summer Kids Camp program for the past 3 years. It takes me one hour from my house to get there, but I don't mind because the experience is really worth it. In Summer Kids Camp, We learn all about being in a show. We learn the songs, the music, and if the kids want lines, we all usually end up having at least a few lines. During the camp day, we make a craft that relates to the show, and we made shirts for our costumes. Since I was one of the older campers this year, I was also able to assist the younger kids. It was really fun, and we all made friends. At the end, we put on a fun show that our family and friends got to see. It was a real performance on the stage and all the kids learned so much about theater. As a parent, teacher, and former professional actor, I am thrilled to have a program of this caliber available right within our community. The youth education programs are exceptional, providing our children with the ability to work alongside professionals to discover, learn, and create within every aspect of theater. In the youth camps, elementary and middle school students express themselves through improvisation dramatics, get hands-on with instruments from the orchestra to learn about the pit, design and create costumes and stage makeup in real backstage workshops, develop reading skills and public speaking confidence by reading and performing scripts, and build character and discipline as they rehearse and perform productions, which are open to the community. Our children are working and learning alongside professional musicians, local educators, dancers and choreographers from NYC, and guest artists in many related disciplines brought from the wider region. At risk and disadvantaged students have programming available here to involve them in theater and the arts, relate it to educational content from their classrooms, and open new positive opportunities in which they can express themselves and succeed in group experiences. Our comprehensive youth programming offers after school, summer, and school break sessions, special seminars ranging from stage combat to theater dance with guest artists, age-specific programs for children 5 - 12 and teens. It is extraordinary to find a program of such depth and variety, and to have it right within Batavia, accessible to students from a wide area of Upstate NY, is invaluable.